Karen White could get mad at the stereotypes, but she’s too busy engaging high school students so that they graduate with the most current skills needed to become successful employees or continue on to post secondary education. Some of the “better technology” White references includes cutting and welding products provided by Victor Technologies to support the school’s Manufacturing Technology program. The products are some of the most innovative equipment available, such as the Thermal Arc® Fabricator® 252i and Fabricator 211i “3-in-1” MIG Stick- TIG welders, the Thermal Arc 201TS TIG/Stick welder and Victor® Thermal Dynamics® CUTMASTER 42 plasma system. These are the type of products students would use in a career as a mechanical contractor (HVAC, process pipe fabrication), in an automotive repair facility and in thousands of fabrication operations nationwide. 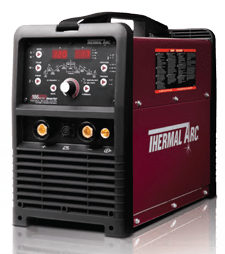 While Thermal Arc welders provide a superior multi process output and can teach students about welding controls that they would use on industrial equipment, they are priced at a fraction of the cost. Most importantly, these products use some of the most advanced inverter-based technology available. In addition to portability and user friendly controls, they offer superior arc performance, which makes it easier for MST students to learn to weld and cut. Traditional education organizes learning in silos that isolate the subject matter. Further, it moves students from subject-to-subject and year-to-year with little regard for competency. As a result, students become disengaged, bored and under perform. Not so at MST. For example, a student in the Residential Carpentry program will learn Algebra and the Pythagorean Theorem (a2 + b2 = c2, where c represents the length of the hypotenuse, and a and b represent the lengths of the other two sides). On the academic side, students cannot move forward until they have an 80% mastery level. MST sets the bar even higher for its 18 technical programs. At MST, students control their own individualized learning plan, and the school will be incorporating a learning management system (LMS) that also enables students to work on a tablet and track their progress. Students understand why they are in a class, see exactly what they need to learn and understand that they are becoming proficient in core competencies according to a plan of their own design. Students also work at their own pace. 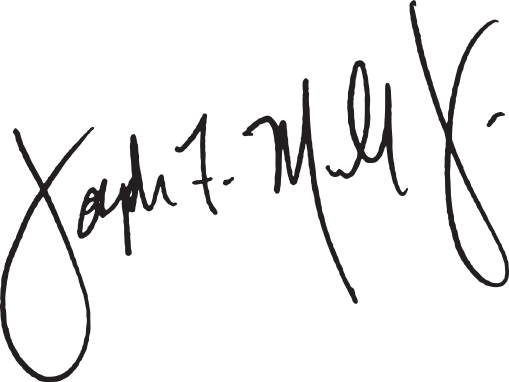 This type of learning is especially exemplified by the Kahn Academy, an approach considered at the forefront of education, parts of which are being adapted by MST. Since opening in 1982, MST has offered career programs to junior and seniors at seven area high schools. Students would attend these schools for academics, and then spend 100 minutes each day at MST for CTE. Beginning with the fall 2012 semester, “MST 2.0” now also offers a four year program and is the only school approved by the State Board of Education to combine academics and CTE. In any event, students appreciate learning in MST’s relevant, competency-based manner. 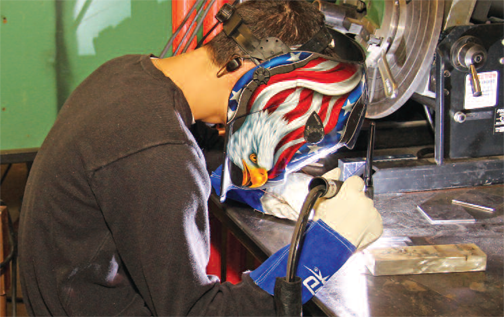 students spend more time in the lab, which includes three welding booths, a permanent TIG welding and plasma cutting station and two portable welding tables. It also includes a band saw, drill press, press brake, shear, a lathe and a CNC milling machine. “We try to get them focused on core skills in the classroom so that when they come into the shop, they’re more knowledgeable on different technologies and can better apply them in school and community projects,” Cassidy says. He emphasizes that projects provide real applications for students. 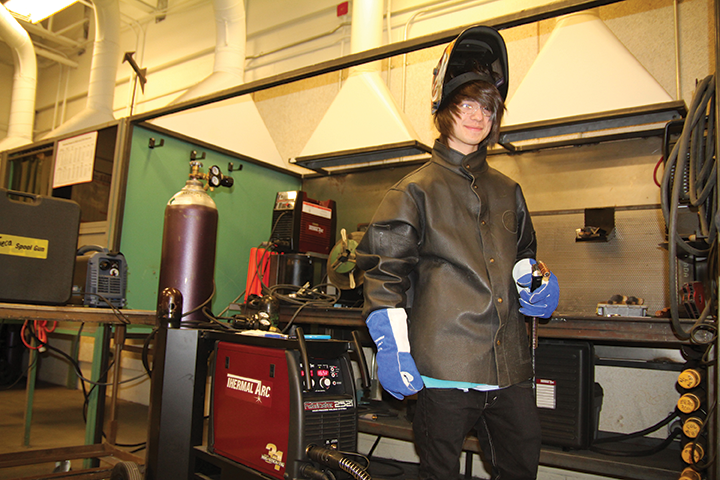 “The students not only did the duct work [for ventilating the TIG welding/ plasma cutting station], they also designed the welding booth, the welding table and all the implements around it to support all the welding processes,” he says. “We try to repair as much as we can to help the school out and save money so it can go toward other things that we really need,” comments senior Victor Monvoig. For example, “The Culinary Department has a very nice table set-up and banquet. Their tables were starting to break…so we made these little brackets that helped stabilize the table legs.” The Culinary Department returned the favor with a free tray of cookies. Currently, Cassidy’s class is building a large hopper to solve an ongoing conflict in the Residential Carpentry program: who empties the 55-gallon drum of wood chips at the end of the day? “My students came up with some ideas, sketched them out, drew it up in SolidWorks, ordered the metals themselves, cut the metal and fabricated a woodchip storage bin that can be emptied out on a weekly basis,” says Cassidy. MST offers the woodchips to local farms, adding a green aspect to way the school connects with the community. While at the event, Cassidy struck up a conversation with Terry Moody, a Council member and Victor Technologies’ Executive Vice President of Global Operations. Adding inductance increases the fluidity of the weld puddle, which especially benefits stainless steel applications because the heat tends to remain very localized. Welds can have a high crown (a potential source of weld failure) and don’t fuse well at the edges of the plates being joined. A more fluid weld puddle flattens the crown of a weld and promotes good edge fusion. MIG welding for the first time. “The arc characteristics are amazing. I was very, very impressed with the inductance control,” states Cassidy. Students will especially appreciate two other features of 3-in-1 welders, both of which make it easier to learn to Stick weld. The Adjustable Stick Hot Start provides an extra boost of current for a few milliseconds during arc start, which in turn helps prevent the electrode from sticking. With arc starts being one of the most common sources for weld failure, the Hot Start function has literally saved welding careers. 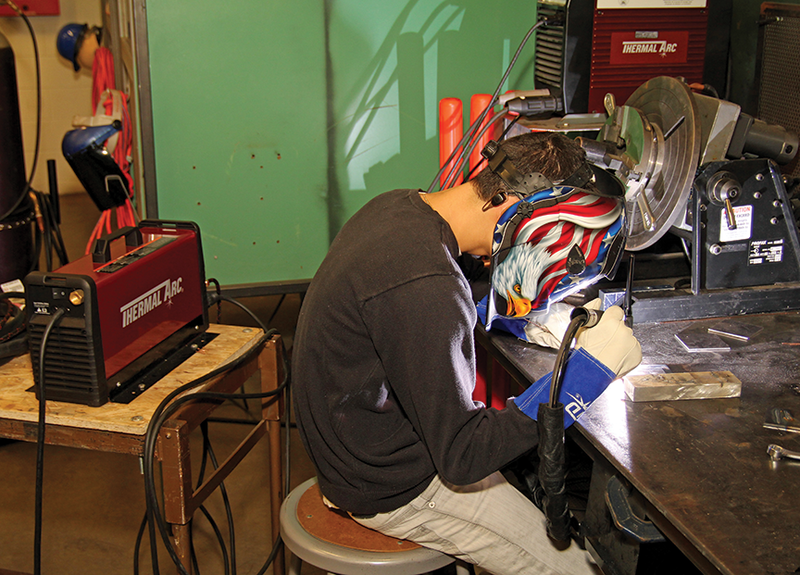 Because it makes learning easier, educational facilities can provide students with a better experience by training them on welders with an Adjustable Hot Start function. Stick Arc Force Control adjusts arc characteristics for all electrodes, including E7018 for structural steel and E6010 for pipe welding. Arc Force Control also enables the operator to push the electrode into tight spaces (such as deep grooves and corners) and prevent the electrode from sticking as voltage drops, solving another common point of frustration for students. 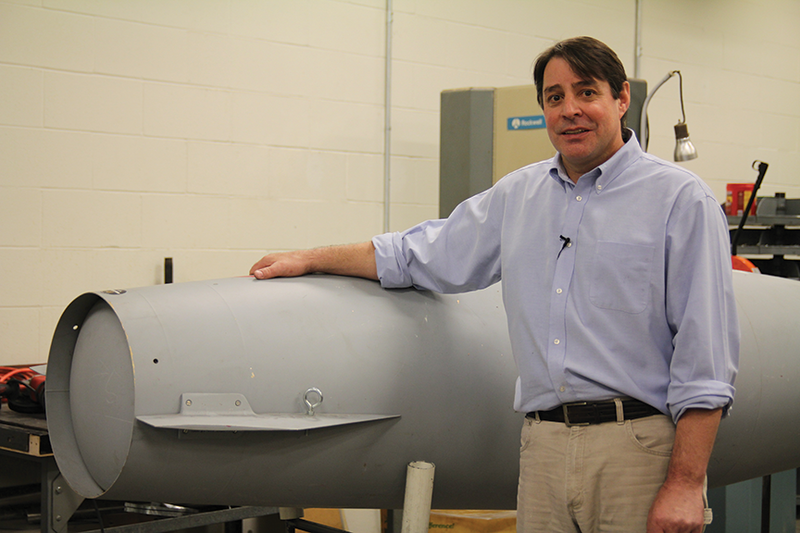 Following his “If someone does it for you, you’re not going to retain that information” philosophy, Cassidy had the students assemble the Victor Technologies’ equipment when it arrived. This included the cart/ cylinder rack for the 3-in-1 welders, as well as the cable and hose connections. That said, the 3-in-1 welder’s set-up chart makes set up easy. It provides diagrams showing cable and control connections for each of the welding processes, as well as recommended welding parameter guidelines. In addition to being easy to set up and use, the Fabricator 211i, Thermal Arc 201TS and CUTMASTER 42 all offer the flexibility to use 115V or 208- 230V primary power. Pythagorean Theorem, MST and its students live in a world of interconnectedness. That also extends to business and industry. Who Said Nobody Makes a Great 3-in-1 Machine? Victor Technologies also saw the same gap in the marketplace, which led to the development of its 3-in-1 Series of welders: the Fabricator 141i, 181i, 211i and 252i. Each of these welders is easy to set up, easy to use and incorporates advanced inverter technology that improves welding performance. Victor Technologies benchmarked the performance of 3-in-1 welders against the top welders in their respective categories. 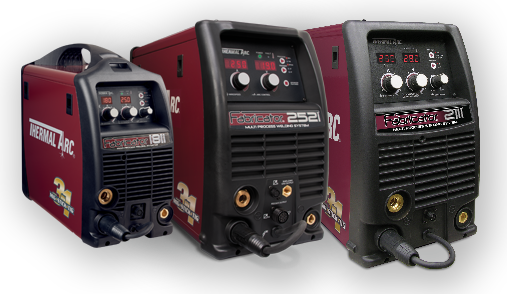 In all cases, the arc performance of 3-in-1 welders meets or exceeds industry benchmarks. In the case of the Fabricator 252i, its performance is exceptional. Victor Technologies designed Fabricator 252i from the ground up at its facility in West Lebanon, N.H. The Fabricator 252i is so advanced that it can sample the welding voltage and current four times every 50 microseconds (a microsecond is 1 millionth of a second) and adjust the welding output current once every 50 microseconds (or 20 kHz). Conversely, the benchmarked Stick/TIG inverter had a response time of 800 microseconds, or 16 times slower than the Fabricator 252i. This means that the Fabricator 252i can detect an unstable arc condition, correct it and optimize the welding output before a competitive industrial machine is even aware that an unstable arc exists. “Superior speed, coupled with our patented control algorithms, produces superior welding performance in all processes,” says Tom Wermert, Senior Brand Manager – Welding Products. “With a 3-in-1 welder, instructors like Dan Cassidy don’t have to compromise when selecting a welder for their classroom. Further, the fact that schools can acquire a premium multiprocess system for less than $2,500 will please administrators such as principal White.” “These 3-in-1 machines have all the earmarks of being one of the industry’s best machines for schools, auto body shops and light fabrication shops. It’s a versatile unit,” Cassidy confirms. Traditional education organizes learning in silos, which isolate the subject matter. It moves students from subject to subject and year to year with little regard for competency. As a result, students become bored and under perform. But at the Manchester School of Technology, Manchester, N.H., students are learning under a new paradigm that integrates the presentation of concepts with hands-on practice. For example, a student in the residential carpentry program will learn algebra and the Pythagorean theorem and immediately put that knowledge to use. Since opening in 1982,MST has offered career programs to juniors and seniors at seven area high schools. Students attend these schools for academics, and then spend 100 minutes each day at MST for Career and Tech Education (CTE). A four-year program launched last fall, dubbed MST 2.0, it is the only school approved by the state’s board of education to combine academics and CTE. On the academic side, students cannot move forward until they have an 80 percent mastery level. MST sets the bar even higher for its 18 technical programs. “In our CTE programs students must have a 90 percent mastery in order to be successful,” saysWhite. MST students control their own individualized learning plans and track their own progress. They understand why they are in a class, see exactly what they need to learn and understand that they are becoming proficient in core competencies according to a plan of their own design. Students also work at their own pace. press, press brake, shear, lathe and CNC milling machine. “We try to get them focused on core skills in the classroom so when they come into the shop they’re more knowledgeable on different technologies and can better apply them in school and community projects,” says instructor Dan Cassidy, who leads the manufacturing technology program. Until 2012, the school’s cutting and welding equipment mostly consisted of one unit for each process. 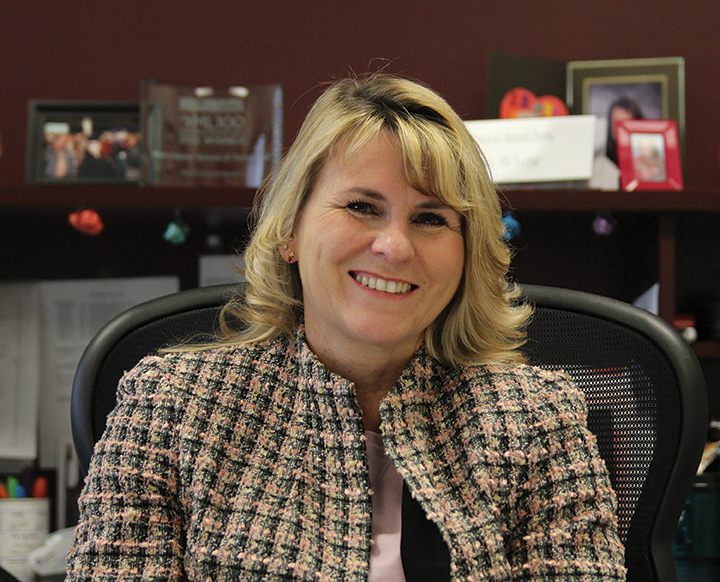 However, a chance encounter changed that.While attending the Manufacturing Leadership Council’s eighth annual leadership summit, Cassidy struck up a conversation with Terry Moody, Victor Technologies’ Executive Vice President of Global Operations. Ultimately,Victor Technologies worked with Cassidy to create an economical but comprehensive equipment package for the MST program centered on its Fabricator 211i and 252i three-in-one welders. Ideally suited for the MST curriculum, the welders easily switch from stick to TIG to MIG and permit students to choose which welding processes they want to learn. “Even for an old-school person like myself, the technology inside the three-in-one makes welding simple,” says Cassidy. Cassidy emphasizes that projects provide real applications for students. “The students not only did the duct work [for ventilating the TIG welding/plasma cutting station], they also designed the welding booth, the welding table and all the implements around it to support all the welding processes,” he says. The students also assembled the Victor Technologies equipment when it arrived. This included the cart/cylinder rack for the welders, as well as the cable and hose connections. “If we train young people to understand how processes work, we’ll have a better prepared U.S. workforce,” Cassidy says. The 3-in-1 is the ONLY Welding System You Need. PERIOD. 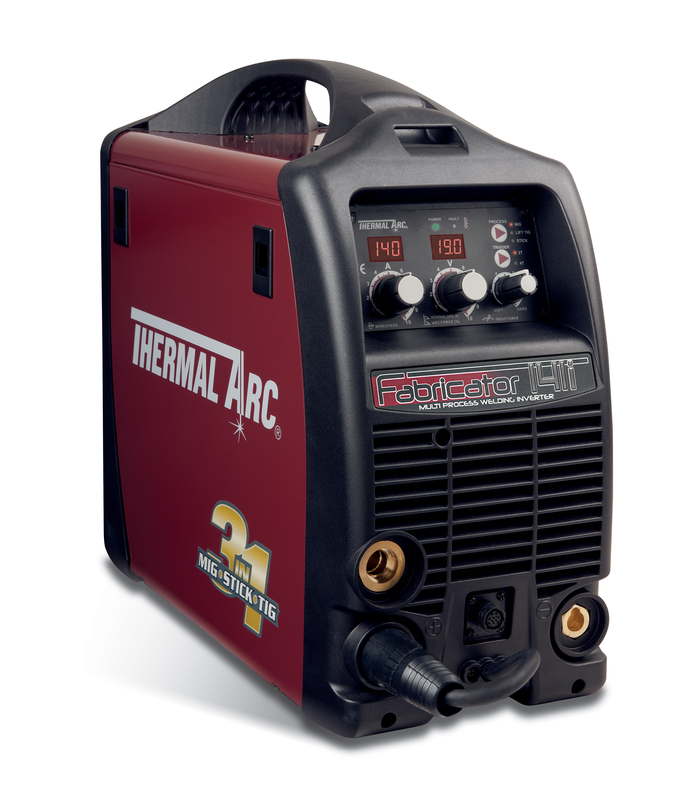 The Thermal Arc 3-in-1 Series multi-process welding systems have changed the game in welding. A new standard for portable welding equipment delivering 3-in-1 MIG, Stick and TIG capability from one integrated portable system. The Fabricator® 181i is a portable powerhouse designed to deliver from 10 to 180 Amps of welding output power from 230 Volts input. The Fabricator® 252i can deliver high output, high duty cycle for light industrial welding applications. The Fabricator® 211i offers maximum versatility, accommodating 4″, 8″ and industrial size 33 & 44 lb.12″ spools, 210 Amps of maximum output, and 115 and 208/230 VAC input power for virtually any welding environment. Thermal Arc…THE leaders in integrated multi-process solutions. The 186 AC /DC offers a complete AC/DC TIG and STICK system solution that is ready for any application. This fully featured, professional performance machine has been made easy to use. The 186 AC/DC provides higher output,higher duty cycles and is ready to perform. Check Out the Full Line of Thermal Arc Welders! High Output. High Duty Cycle. Ready to Perform. With a list price of $850, multiprocess welding flexibility and easy set-up, this 32-lb. welder provides the best value for DIY and home/hobby welding. 3-in-1 Series now complete; four welders offer outputs from 140- to 300-amps and feature sets that benefit everyone from gearheads to contractors and fabricators. 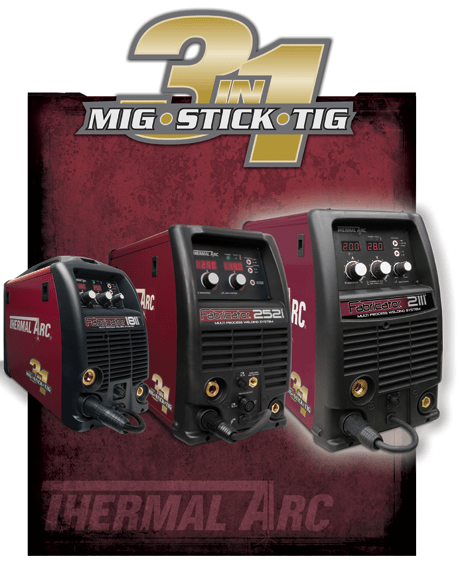 Victor Technologies will complete the Thermal Arc® 3-in-1 Series with the introduction of the Fabricator® 141i MIG-Stick-TIG welder, scheduled for U.S. and Canada release in early 2013. The Fabricator 141i is the first multiprocess welder that runs off 115V household current. It is designed for DIY and home hobby use, as well as other light welding projects in motorsports, auto repair, farm/ranch, metal art and maintenance applications. The welder incorporates a built-in wire feed system and accepts 4” or 8” spools of wire. It weighs just 32 lbs. and offers 10 to 140 amps of output power for MIG and Lift TIG welding, and 90 amps for Stick welding. The unit comes with a 115V/20 amp plug, and includes a 115V/15 amp adaptor which enables plugging the unit in to a standard household outlet. MIG/Flux Cored: 100 amps/19 volts at 37% duty cycle; MIG welding with .023” & .030” solid wires and .030” & .035” self-shield flux cored wires. Stick: 80 amps/23 volts at 35% duty for welding with 1/16” and 3/32” electrodes such as 6011, 6013, 7014 and 7018. DC TIG: 100 amps/14 volts at 37% duty cycle using Lift TIG for arc starts without high frequency. “Even a beginner should be able to set up the Fabricator 141i and start welding in a very short time,” says David Wilton, Vice President, Global Welding Products, Victor Technologies. A set-up chart inside the wire feed compartment guides users with helpful diagrams and welding parameter recommendations. Push button controls and LED displays simplify operation. 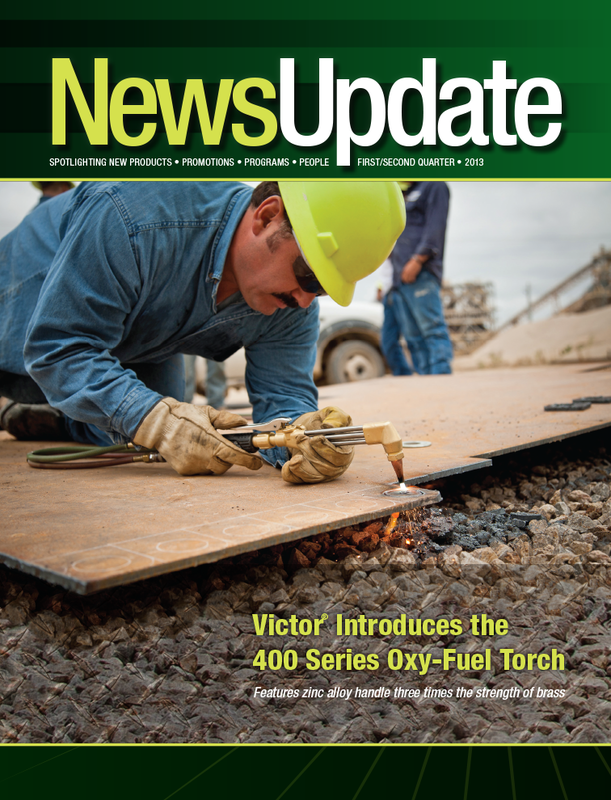 Wilton notes that Victor Technologies now offers Fabricator 3-in-1 Series welders with outputs from 140 to 300 amps. Other products in the Series include the Fabricator 181i (which uses 208-230V primary for welding thicker metal), the Fabricator 211i (for the flexibility of welding with either 115V or 208-230V primary for location flexibility) and the feature-rich Fabricator 252i (for premium arc quality and optimized fabrication performance). Stick Arc Force Control to adjust arc characteristics for different electrodes and a Stick Hot Start function that helps prevent the electrode from sticking. Superior MIG arc starts and better weld puddle stability, both of which promote better weld quality. MIG inductance control, which improves arc stability and reduces spatter. Lift TIG for arc starts without high frequency and automatic TIG downslope control, which ramps down the current at the end of a TIG weld to eliminate crater formation. For example, MIG welding is the easiest process to learn, provides heat control for welding sheet metal, good productivity and the flexibility to welding with steel, aluminum or stainless steel welding wires. The Stick and self-shielded flux cored processes work well in windy and outdoor conditions, as well as on rusty or dirty metal. The DC TIG process enables users to weld stainless, copper, nickel, bronze or brass alloys or on applications requiring precise control over heat input and weld bead placement.